We now offer a Wax/Oil combination that is available to new vehicles only. Our Wax/Oil product is truly an exceptional environmentally friendly, water-based, long-term, semi self-healing rust preventative. It can handle the toughest of applications reliably. It offers a great combination of desirable characteristics that lead UPS and Rider Truck rental use it on their vehicles! When NH Wax n Oil is fully cured, it presents a non-tacky, extremely durable and almost “elegant” black coating that will stand up to the toughest of environmental conditions. We apply our own NH Oil Clear oil formula to the inner cavities, seams and moving components on the vehicle. For as little as $99.00 every 24 months, your protection will be maintained with our latest, most effective formula – ensuring your vehicle looks its best with each passing year. 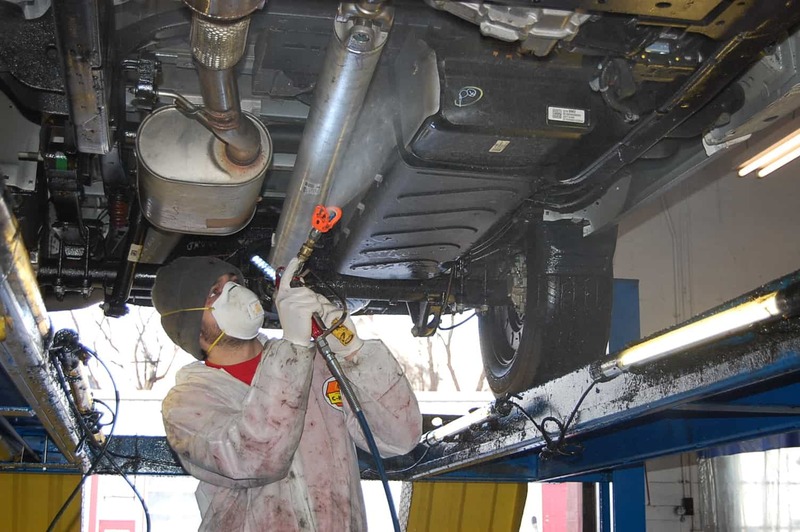 NH Oil Undercoating® Wax Oil Rust Prevention See the difference for yourself! Rustproofing has never been more important because of the introduction to salt brine on the roads.The use of brines is known as anti-icing or pre-wetting measures. Brines have the same melting characteristics of solid rock salt, but since it is applied in liquid form, the salt can begin to work immediately. The brines are also more effective in lower temperatures. You need to be proactive with corrosion because Anti-icing is currently recognized as a pro-active approach to winter driver safety by most transportation agencies. Pre-wetting [using salt brines] has been shown to increase both the performance of solid chemicals and abrasives, as well as their longevity on the roadway surface, thereby reducing the amount of materials required. All our specialized Wax Oil products will protect your vehicle against damage caused by salt, liquid de-icing and winter driving conditions. They are designed to penetrate the seams and crevices. It eliminates moisture. It actually eliminates/removes oxygen and moisture from the surface and stops rust and corrosion in all metals while present. It protects vinyl and plastic surfaces from UV rays and improves the function of moving parts through lubrication. Our environmentally friendly products contain no solvents and detergents. NH Oil is designed to create a barrier that can’t be broken, chipped or cracked. By staying fluid, our petroleum-based rust protection heals back over after any abrasions providing lasting protection, even in extreme conditions. Stop by today for an evaluation!